Things to know when buying or refurbishing kitchen cabinets. Books have been written about making kitchen cabinets—and one could be written about buying them, too. But there are some key considerations and terms you should know. Here are a few brief guidelines to help in your shopping. New or refaced. Perhaps the least expensive option in a kitchen remodeling is to replace existing cabinets. This means the boxes that contain the shelves and drawers remain in place, saving demolition, construction, and purchase costs. Only the fronts of the cabinets are replaced, which usually involves new doors, face frames, and hardware. If you’re happy with the layout and the number of cabinets you currently have but want to give them a new look, this may be the right way to go. Material choices. Whether you’re buying all-new cabinets or just refacing, you’ll need to decide whether you want all-wood, wood veneer, or laminate doors and face fronts. 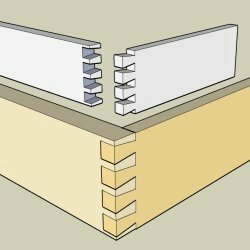 With veneer cabinets, a thin ply of wood is applied to a substrate of plywood or a composite material like particle board (plywood is better, but more expensive). Laminate doors are often fabricated of polyvinyl chloride sheets that are heated, molded, and applied to a substrate to give a seamless appearance. Buying the boxes. If you are buying all-new cabinets, you’ll want to know of what materials the boxes are made. 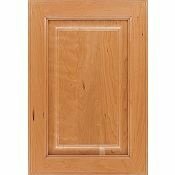 Solid wood cabinets these days are rare and expensive; even plywood boxes are becoming pricy and less common. More likely, you’ll encounter melamine, a reasonably sturdy composite material made of resins. It will chip but is stronger than the lesser choices, which are little more than paperboard, sometimes surfaced with vinyl. When shopping for cabinets, ask to look at a cabinet box; a little visual examination will reveal how sturdy the secondary materials are. How well are the pieces fastened together? Are nails or screws apparent to the eye? It doesn’t take a cabinetmaker’s training to distinguish the wobbly and shoddy. In general, the quality you get is a function of the money you’re willing to spend. Solid wood cabinets cost more than cabinets made of composite materials. Hand-rubbed finishes, Euro-style hardware, mortise-and-tenon joinery, and other top-of-the-line qualities come only at added expense. Remember, too, that accessories can add both to the convenience and the price of your new kitchen: sponge drawers, lazy susans, gadget garages, glazed doors, recycling bins, and built-in pantries are only a few of the options available.